The new student-curated exhibition at the Bowdoin College Museum of Art, Fashioning Modernity: Art and Independence among Yorùbás in Nigeria, contains colorful, mostly handmade fabrics from the 1960s, an exuberant time when the nation was transitioning from colonialism to independence. The student curators were eager to show that the pieces in the show represent more to Nigerians than art objects to admire in a museum. They laid out the gallery in such a way to help visitors better understand how the objects might have been used in daily life. This meant that rather than hanging fabrics on the wall, the students wanted to fold, tuck, and knot the exhibition's handmade cloth into styles that Yorùbá women actually wear. So they asked Nigerian-born Anu Asaolu ’19 for help with these techniques. Asaolu was taught how to wrap cloth into both formal and everyday outfits by the women in her life—her mother, aunts, and grandmothers. The exhibition features objects from a collection recently donated by Dorothy Hassfeld, a former Peace Corps worker who lives in Brunswick, Maine. Hassfeld was one of the first Peace Corps workers in Nigeria. She began her volunteering stint there in 1961, a year after the nation achieved independence from Great Britain. This collection had not been exhibited in the Museum of Art until professor Allison Martino and her fall-semester class African Art and Visual Culture got to work learning about the collection's objects to assemble into a show. The new exhibition relates to some of the research interests of Martino, who is Bowdoin's Andrew W. Mellon Postdoctoral Fellow in Africana Studies. She studies the production, use, and meanings of Ghanaian textiles. When she learned of Hassfeld's collection this summer, she seized the chance to give her students a hands-on museum experience. "All the students were involved in the curatorial process, deciding how we wanted to develop the show, and what theme and structure and narrative we wanted to tell," Martino said. "We discussed how that would be expressed visually and how it would look as visitors experienced the space." 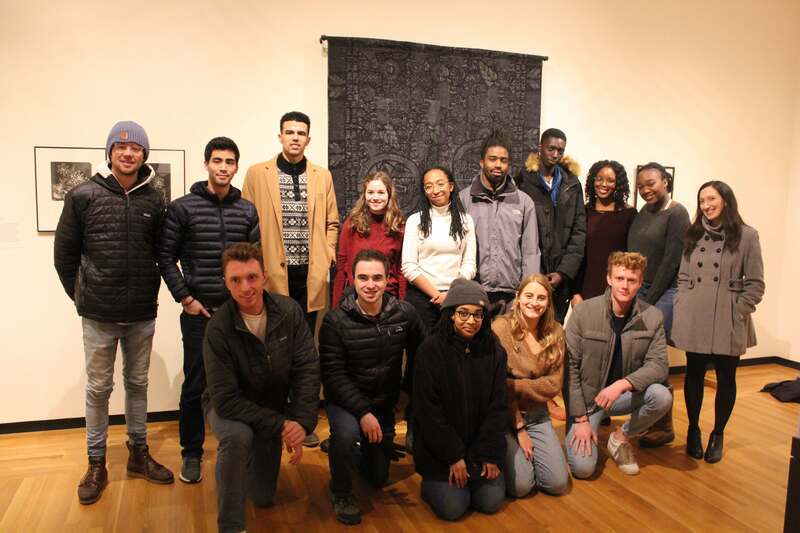 Two students from the class—art history major Kinaya Hassane ’19 and Africana studies and sociology major Harrison Dunne-Polite ’19—gave a tour of the show last week. Fashioning Modernity opened January 17 and runs through March 17. Before making important curatorial decisions, Hassane and Dunne-Polite explained that as a class, they studied the problematic history of Western museums displaying African art. They also evaluated the common misconception that strong cultural traditions are static and unchanging, when in fact they're highly mutable and responsive to evolving trends and ideas. "So we were interested in thinking about how these objects relate to this theme and how Africa is not a place stuck in the past but is constantly evolving and coming up with innovative art forms," Hassane said.